If you’re anything like me, you’ve got some BIG GOALS for yourself… and you know that you won’t reach them by wasting time or procrastinating. But staying productive and focused while avoiding distractions and overwhelm is no easy feat! My efficiency went up about 20 levels when I discovered the concept of TIME BATCHING. All it really means is that you focus on one task, or one type of task for a set amount of time. For example, I frequently work on emails for my email list 1 hour and one hour ONLY, and then move onto the next thing. Or I’ll work on client check-ins for 45 minutes straight without doing any other tasks. This method allows me to really get into a flow with whatever I’m focusing on at the time rather than bouncing around from tab to tab, trying to switch gears every few minutes. My brain gets VERY overwhelmed when I attempt to do that. As a bonus hack, I highly recommend getting one of these timer cubes off of Amazon. All you have to do is flip it onto the desired number of minutes and get to work! I can’t use my phone as a timer because I’ll inevitably get sucked into scrolling Instagram, Twitter, or Pinterest… my productivity KILLERS! Between managing my social media, editing YouTube videos, writing content, and let’s be honest… online shopping, I spend hours a day staring at a screen. I’m sure you’ve noticed that when you do the same, your eyes get super tired, you might feel a headache come on, and it gets hard to focus— NOT great for productivity. That’s because our screens are powered with high-energy blue light that is really hard on our eyes. Long-term exposure to blue light has also been linked to greater risk of vision loss… no thanks! You can get more info on blue light here. Because my job literally revolves around technology, I don’t have the option to avoid screen time altogether, but I CAN make it way more comfortable and better for my eyes! Cue: blue light blocking glasses. There are a lot of blue light glasses brands out there, but I recently got two new pairs from Zenni, and I could not be more obsessed! They’re light weight, SO stylish, and super reasonably priced, too. 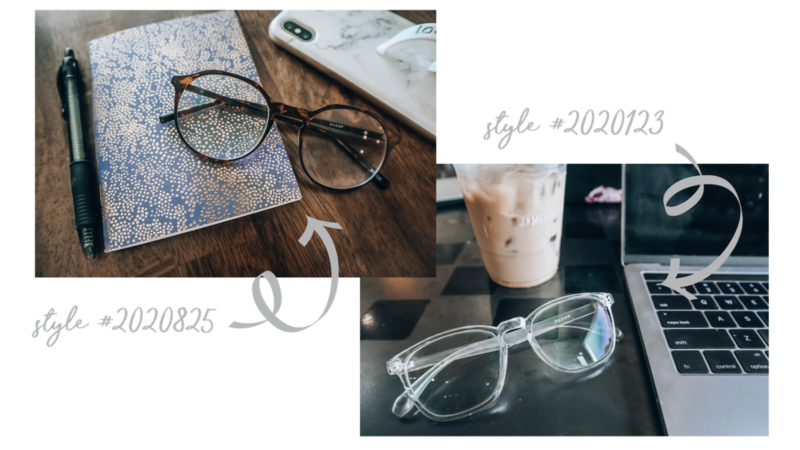 I literally wear my Zennis every single day, even when I’m NOT in front of a screen because they’re the perfect accessory, too. So when they asked me to parter with them for their college-inspired, Vision For Success campaign, it was an a no-brainer! As a recent college grad (2 years ago is still considered recent, right?! ), I so wish I would’ve had these glasses to help me stay focused and keep my eyes healthy. Now, I don’t personally wear prescription glasses or contacts, but one of the best parts about Zenni is that you can get just blue-light blocking glasses like I did, OR they can actually add a blue-light blocking coating to ANY prescription glasses. There are SO many styles and customizations available, it’s insane! This one is seemingly super obvious, but I have to remind myself of it ALL the time! I’m the type of person who likes to feel busy, but busy does NOT equal productive. So when I am trying to figure out what I need to accomplish in a day/week/month/year (so necessary for reaching goals! ), I have to really be intentional about it because otherwise I’ll get sucked into busy work that doesn’t actually move the needle. Re-organizing my Pinterest boards is super satisfying… until I realize that it didn’t actually DO anything to move me closer to my goals! When I’m filling out my schedule and writing my to-do list, I make sure to pick out 2-4 things that are high priority and put those at the top. If I accomplish all of those items, then that day was a success, and I have the option to be done for the day, or move onto the lower priority items if I still have time and energy! It’s easy to let your to-do list get out of control, but remember: if everything is a priority, nothing is a priority. Whether you’re a busy college student with lots of places to go, people to see, and things to do, or you’re like me and you work from home and create your own schedule, you should always be booking yourself solid. That doesn’t mean staying BUSY every minute of every day, it just means that you’re very intentional with how you’re spending your time. For me, keeping daily calendar FULL not only keeps me focused and moving down my to-do list, but it also prevents overworking myself and burning out. By building my high priority tasks, appointments, meetings, AND me time into my day, I make sure that business, personal life, and self-care are ALL in balance— so crucial! I always schedule my days with an idealistic mindset. Will everything fit together and unfold perfectly? Probably not, and that’s OKAY! But by planning for the best, I am able to maximize my time and have total clarity over each day’s tasks. When I have a lot on my plate and need to squeeze every drop of productivity out of my working hours, passive multitasking is a LIFE SAVER. I’m not normally an advocate for multitasking in general (your brain literally can’t focus on multiple things at once), but passive multitasking is different— it means that you are productive mentally while something is going on physically. For example: I do emails and reply to Instagram comments while I walk on the treadmill, or listen to a podcast while I drive, or even write captions while I’m in line at the post office. You get the idea. I feel like bluetooth headsets (all the rage in the 00’s) gave passive multitasking a bad rep— like hello, holding meetings while you check out at the grocery store is crossing the line… but as long as you’re being polite about it, there’s absolutely nothing wrong with making the most of your time! I’m never without my blue light glasses + a decaf oat milk latte!